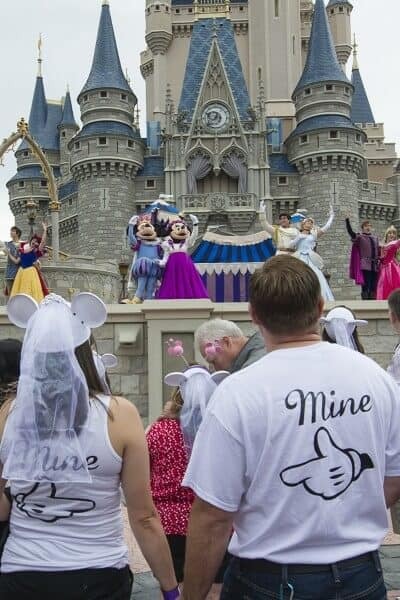 Dozens of couples were invited by the Disney Parks Blog to gather early in the morning on Valentine’s Day 2013 to renew their commitment to each other in a special ceremony in front of Cinderella Castle at the Magic Kingdom. Included in the ceremony were Cinderella and Prince Charming, Aurora and Prince Philip and Mickey Mouse and Minnie Mouse, hosted by the Major Domo and organized by Disney Fairy Tale Weddings. The ceremony was part of Limited Time Magic‘s “True Love Week” which continues through Feb. 17, adding special dinners, character greetings, and decorations at both Walt Disney World and Disneyland. I love all the magic! I love the excitement and all the flowers and the happiness!